Spring is here, meaning it's time to travel. If you hit the road in Turkey, you can either enjoy the gourmet dishes of Anatolian cuisine or discover the history of the Aegean or you can even do both while enjoying beautiful nature. If you are feeling adventurous, let's look at the spring destinations all over Turkey. The Thracian city of Kırklareli, which is only a two-hour drive from Istanbul, is known for its natural wonders, but the real wonder waiting to be discovered is İğneada. Although it is a destination not known by many, I had the pleasure of getting to know this spectacularly peaceful place years ago. I took long walks in Longoz Forest and filled my lungs with oxygen and tasted its famous hardaliye, a nonalcoholic fermented beverage made from grapes and located ingredients, and beet molasses. April is the best time to visit İğneada as the weather is neither cold nor too hot, which means you can enjoy discovering this cute little town founded on a huge rock dating back 65 million years. However, it is better to be cautious and take a jacket for the cold breezes at night. There are few motels in the town where you can spend a day or two. If you prefer your stay to be a little more luxurious, like I do, you can book a room at the Bakucha Hotel&Spa in Hamitabat village in Lüleburgaz district. While there be sure to check out the vineyards spread over a 200-hectare-area and enjoy the walking tracks and picnic areas where you can spend a nice afternoon with your family. Thrace is famous for its meatballs, so don't visit the city without trying them. Kasaplar Arası Inn has made a name for itself with its restaurants that not only serve meatballs but all the delights the region has to offer. Let's turn our course to the Black Sea region and discover Karabük's famous and historic town of Safranbolu. Recognized by UNESCO as a World Heritage Site, Safranbolu is known for its historic Ottoman houses dating back to the 17th century. "The City of Safranbolu is a typical Ottoman city, with typical buildings and streets, and played a key role in the caravan trade over many centuries," UNESCO said in its description of the city. Hailed as an outdoor museum and protected city, Safranbolu offers a tranquil setting for visitors. The city's iconic sites of the Old Mosque, which was originally built as a church, the Old Bath and Süleyman Pasha School (madrasah), where you can watch a beautiful sunset, were built in the early 13th century and are worth checking out. April is a perfect time to visit the city. If you want to spend the night near the town center, Aygür Hotel, Zalifre Hotel and Safran City Hotel Spa are top choices. I discovered Foça while my brother was assigned there for his military duties. Then I understood where the phrase "Sunset in İzmir is beautiful, but it is a different kind of beautiful in Foça" comes from. 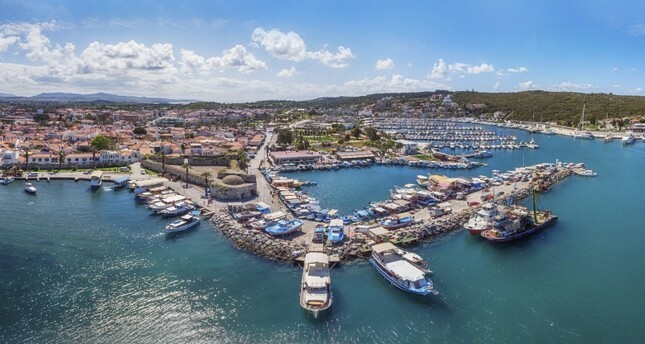 Foça, also known as Phocaea, is one of the 12 Ionian cities that were founded in the ancient times. Foça, which is an old port, looks like an open-air museum. The Temple of Kybele is one of the first places you must see if you ever find yourself in this coastal town. Taking a boat tour in the cold Aegean waters is also a must-do. Foça is very delightful when the sun goes down. There are numerous seafood restaurants where you can find the freshest fish and mezes after a long day of sightseeing. The ancient town of Behramkale, commonly known as Assos, is another destination where you can experience spring in the most beautiful way. Apart from its historical touches, the town offers clean air and mild weather, which is hard to find in the cities. There are no luxury accommodations, but you can feel the warmth of the local people just from their eyes. Here you can enjoy the finest, tastiest, freshest and most affordable seafood in the area.